We have seen movies that fail to age well: the special effects appear dated now or the material is fairly historic and no longer represents current dilemmas, while other times the film has grown old because it portrays outdated stereotypes and blatant racism (like The Birth Of A Nation, for example). We glorify and applaud movies that age well or show no age at all and, instead, remain timeless. So has there ever been a case where a film doesn't age but continues to recognize societal issues? The case in point here is Bernard Rose’s 1992 horror film Candyman, based on Clive Barker’s The Forbidden. This is still a real issue today. This specific clip could easily be transported to present day and cycle through Facebook and Twitter posts as a modern-day problem. The murder of black Americans is still a real, current, and thriving problem in America. Our protagonist Helen falls victim to the real Candyman’s terror and has to sacrifice herself. It is both easy and common to place our main character as a victim; especially in the confines of horror where females are especially pigeon-holed into the role of the victim. What is even more problematic is that the film has this lovely, glamorous, young white woman being preyed upon by this black "boogey-man", so to speak. And given the racial history of the United States this sends up red flags right away. This is not to say the film condones racism, but this particular dance between these two individuals is something that is visually rather stirring. Let us put Helen’s victimhood aside for the moment—is it all possible the real victim throughout the film is the community? Cabrini-Green is a real community, not just one made for the film. It was cheap, public housing in the inner-city of Chicago, was predominantly black, and was plagued with drugs, crime, gangs, and turf wars. The director and crew admit to having to pay off certain gangs while filming the movie. One character in the film is Anne Marie, who admits that most white people do not come to Cabrini Green unless they are the legal authorities trying to cause trouble. Anne Marie notes she is nothing more but a working mother whose only interest is protecting and raising her child; yet, she lives in fear ever since her neighbor, another black woman, was murdered by the Candyman. Another character, Jake, has a real fear of the Candyman. He introduces Helen to an old crime scene where a young boy was killed and, as Helen retorts later, nothing was done about it. However, Helen misses the societal context here I believe: we have a white woman looking for trouble, because she doesn't have to live in Cabrini Green. She has no attachment to the community; therefore her working with the police is a non-issue. If any member of Cabrini Green told the proper authorities who the criminal was, it's possible that gang would inflict retribution upon them. This would cause more "black-on-black crime", which the police and society almost always turn a blind eye to. For example, when an innocent young white woman is attacked by a gang leader in a public bathroom, all hell breaks loose. The cops used what they call a “sweep”, where helicopters and SWAT teams come in, working from the top of the complex, working their way down. It is akin to flushing out unwanted creatures in one’s building, like bugs or vermin. Let that sink in for a moment: Helen identifies her attacker and the police are able to pin the murders on him. Case closed, there is no Candyman, right? The arrest of one man does not fix everything. Again, there were numerous gangs, drug dealing, and abundant poverty in Cabrini Green. Their infrastructure was desolate and decaying, so the problem was not one single physical figure, but a systemic crisis. It was the environment of Cabrini Green that bred this man who attacked Helen. Candyman or not, Cabrini Green remains the same. It's unfortunate that Helen dies at the end of the film. Her peers mourn her, of course, because she is our victim. But what about the people of Cabrini Green? Above all, their systemic problems of crime and poverty still exist beyond Helen's narrative. 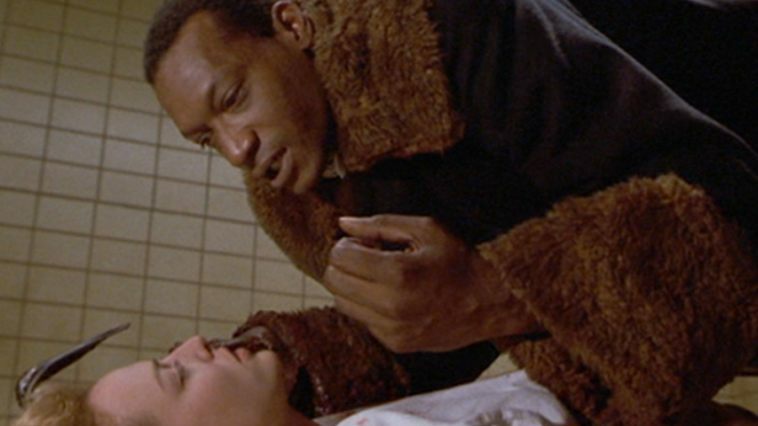 Jake believes the Candyman is now gone, but the story fails to acknowledge that the idea of a young, white woman burning to death in Cabrini Green is guaranteed to send chills down the spines of racists and clinch the teeth of bigots. She becomes an urban legend, but urban legend thrives off of oral history and these stories change amongst time and people. Their socioeconomic status can play a huge role in their particular narrative of events for Helena's story. In the end, we should not see Helen’s death as the real tragedy. While unfortunate, why are we not looking at the setting of Cabrini Green? How did the unfortunate situation of Cabrini Green come to exist? Death is always sad, but it is even more depressing that the families have to continue to suffer in such a climate that is their community. They say man fears what he cannot see, but I would argue man is ignorant of what he sees every day.